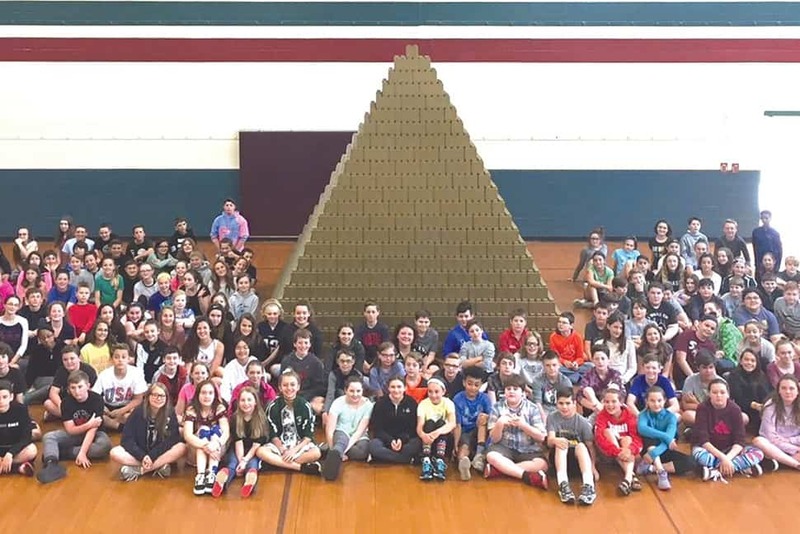 Students at Overlook Middle School in Ashburnham, Massachusetts, built a pyramid with EverBlock bricks. Giving children the chance to build large-scale structures as a part of their play can provide tools for new avenues of collaboration, creativity, and critical thinking. Libraries that present kids with the opportunity to build something they can climb into and interact with can inspire imaginations and a sense of agency in new spaces. Large-scale building toys can also bring variety to children’s areas and events. The following are just a few ways to engage kids in active play. EverBlock took the typical plastic brick toy and made it larger—almost the size of a cinderblock. The bricks fit together with lugs and can be used to build modular furniture, walls, and even small buildings. As a free-play tool, the possibilities are vast, limited mostly by the size of the play space and number of blocks. Bricks come in four sizes that range from three to 12 inches long, all six inches high, with two sizes of top cap: six and 12 inches. Sixteen colors are available, including primary colors, pastels, gold, and translucent. With integrated desktops and shelves sold as accessories, EverBlock can be used to build or accessorize a children’s area and for play within it. The EverBlock website also includes a basic 3D design tool for project planning. A half-inch channel for wiring or support for larger structures runs through the center of each brick, including the half- and quarter-bricks. EverBlock sells reinforcement pins, but the channel will also hold standard PVC or wooden support rods. The largest bricks may be somewhat heavy for smaller children, weighing a little more than two pounds. However, EverBlock also produces a line of cardboard building bricks in many of the same sizes, though more limited colors, called EverBlock Jr.
EverBlock bricks can be purchased individually or in sets. A 50-block play set is available for around $200. Individual blocks cost between $3 and $7. EverBlock Jr. can be ordered in bulk, with 20-packs starting at $26.80. Educational discounts are available. For more information, visit everblocksystems.com. All pieces in the Rigamajig Basic Builder Kit can be packed into the included cart. Designed as a modular toy for New York City’s High Line park in 2011, Rigamajig is a set of straight and curved supports, bolts, wingnuts, wheels, hooks, pulleys, and ropes that allows children to create large-scale contraptions. It includes all pieces necessary to build machines to lift and carry things, as well as structures to climb inside, and to make vehicles and sculptural art. Children’s ability to create structures larger than themselves encourages collaborative play. 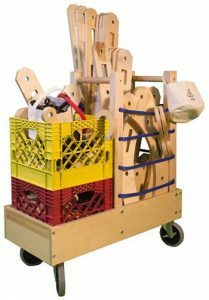 The Rigamajig Basic Builder Kit comes with more than 260 parts, including a cart and milk crates for carrying and storing pieces. The total weight is just under 150 pounds. Add-on kits expand the types of sculptures and machines that can be created. The Simple Machines kit includes gears, levers, and belts for more dynamic building. Two new kits will be released this fall: chutes, which includes tracks for gravity-based play using marbles or water, and locomotion, which includes pieces for building rolling and spinning machines. All wooden parts are made from birch plywood and have a finish that’s free of hazardous air pollutants. The wingnuts and bolts are made from recycled, reinforced nylon. Rigamajig recommends a minimum play space of 100 square feet per kit for children to get the most out of the set. However, since kits can be packed into a mobile cart, a permanent space isn’t required. The Basic Builder Kit is $3,550, and the Simple Machines add-on kit is $1,550. Both prices include shipping. There is a four-week lead time on orders. Find more information at rigamajig.com. Description: Imagination Playground produces a range of foam blocks that can be arranged into life-sized play spaces for children. How do you use Imagination Playground Big Blue Blocks? The Big Blue Blocks allow kids to build and create anything they want when they visit our library. We keep the blocks easily accessible, and kids use them many times every day. I have seen children create tall structures with the blocks and cover the entire floor in intricate patterns. Kids love using the pieces to build houses or caves that they can crawl into with a parent or friend. The lightweight material makes it easy for child-directed play to occur naturally and safely. 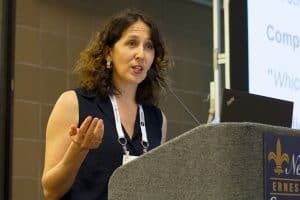 How does Imagination Playground serve your library’s needs? The Imagination Playground serves our library’s practice of open-ended play very well. Toys that inspire children to use their imaginations are a great use of our resources. The blue blocks are versatile and can become countless things, depending on who is doing the building and what experiences or learned skills they bring to the situation. 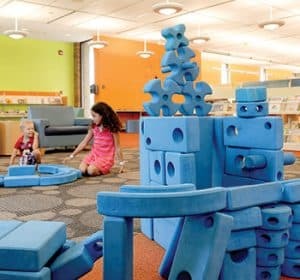 Children play with the Imagination Playground blocks at Arlington Heights (Ill.) Memorial Library. 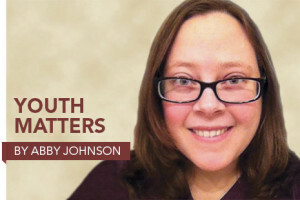 Typically, as kids get older, they build structures with more details such as including a second floor to a clubhouse, or adding a bedroom and kitchen to a train they have created out of the blocks. Younger children observe this, and you can almost see the light bulb go on as they quickly begin connecting more pieces together, to expand what they have already created. Our open play area offers opportunities for kids of all ages to collaborate on their pretend play. That collaboration contributes to improved social skills for children at all levels of development. The variety of shapes and the different ways the blocks can connect are great benefits. The interlocking pieces offer countless opportunities for kids to be creative and expressive in their play. The blocks give kids the freedom to exercise their fine and gross motor skills, learn new vocabulary, and practice problem solving. The blocks are extremely durable, which is important given the high traffic our library gets every day. Additionally, the soft, lightweight foam is a safety feature that makes everyone happy. What would you like to see improved or added to the blocks? Additional shapes would always be welcomed and put to good use!